I like this thread because jon55 steered me in the right direction. Very good evidence of the JT/Zodiac initialing his work. Did ya know that Donna Lass family is unsure when she was born? This information is from the Brian Hass Family Genealogy page c 1999. Hass & Lass are same South Dakota family tree. Mother: MCGUIRE, MARY "MAMIE" J. For someone so famous as a Zodiac victim, they don't have her birth certificate information but they know she died? So, how did Donna Lass get into the army and all the other tidbits about her come to fore? Did ya note the Loma Linda connection...Cecilia Shepard from there? I knew about Brian Hass Donna Lass info since 1999 but you "researchers" have misconstrued the cases for profit too long. WE all have been had when it comes to the Zodiac cases and lots of untrue info out there. I believe she was born & disappeared. But what's the real story about the woman they say came from Indian country Sioux Falls, SD and family knows she died, the reward cipher symbols Indian clues just like Zodiac Jacks that they say her family created? Donna Lass's immediate family most certainly knew when she was born. Just because some distant relative who was researching their family tree didn't know her exact date of birth, that in no way means her own family members didn't know when she was born. I am sure if Ancestry.com had existed when this person did their family tree, they would have been able to find Donna's exact date of birth easily via Birth Records and such. And no one knows what happened to her. She is still listed as "Missing." I believe she is dead, as do many others, but there is no solid proof. I also find your claim that the Lass Reward Poster cipher symbols are more Indian Clues leading to Jack totally unsupportable. And just because one distant relative creating a family tree writes that Donna died about September 6, 1970 does NOT mean the family KNOWS she is dead. This relative is merely drawing a conclusion/sharing an opinion. I am not sure what you are trying to say here Catseye. Are you saying that Donna's family knew her killer and used his Indian symbols on the reward poster on purpose? And even knew she was dead and not a missing person. Like the whole affair was a devious plot involving Jack Tarrance and the family? I don't know, that is how your post read to me but when I think about the entire premise it makes my head spin. WOW! 2 years later but that "four Cent" stamp & other Donna Lass clues! Jack wasn't just simply disquising his handwriting. There is several Native American symbols in this card. I will point them out this weekend. Only Jack was ZK! Thx Jon55! Gees, you trolls look so dumb "Timeline" "sixtieschick". Get a life, move on! I am not going any where, catseye, unless Dennis asks me to. I support him, but that does not mean I have to agree with every harebrained idea you come up with. Keep calling me a troll if it makes you feel better. I don't want to start off on a bad foot on this board and I don't feel the need to insult anyone or argue. Please just forget I asked. Thanks. catseye doesn't have a life, take what she says with a grain of salt. Timeline, don't play into catseye's little games, she's way out there. There's no evidence that sixtieschick and Timeline are trolls. Gee Nanette....that post made sense, why can't catseye's posts make sense, sometimes they do but not for long ? THAT SAID, JUST ABOUT ALL THE TRIBES I LOCATED MATCHING SYMBOLS INFO ON ARE NOW STREETS & SECTIONS OF S. LAKE TAHOE and SURROUNDING REGIONS. WHEN YOU SEE THE DATED/UPDATED INFO AT THE FINAL DECODING PAGE, ASK YOURSELF WHO WAS I TALKING TO AND LEAVING INFO FOR THEM TO GO OVER AS REQUESTED BY THIS DETECTIVE/AGENCY? WHY WAS IT SO IMPORTANT TO KEEP THE NATIVE AMERICAN SYMBOLS AND TRUTH ALL THE ZODIAC CASES CLUES/CIPHERS REVEAL FROM THE PUBLIC? I WILL REVEAL THEIR NAME LATER THIS SUMMER. I HAVE PROOF I TALKED WITH THEM. I was asked to steer clear of this cipher and I felt it was best to stick to officially declared Zodiac Killer ciphers but like before, in March, the pattern of the symbols lead to this reward cipher. But after reviewing details on Tijeras Pueblo Ruins, I can mix the Peek Thru Pines Card in, too. So, June 26, 1970 has the town of Omega, "part of fortune" symbol and Omega is on the way to Tijeras which is in Cibola National Forest. Cibola is the Lost City of Gold the Spanish Explorers were looking for and ended up in what is now New Mexico. Excellent video online: Derelect Epistle: Tijeras Pueblo Ruins, shows the whole area. The clues in Peek Thru Pines Card are, buildings there look like some type of village and the Sandia Ranger Station & Tijeras Visitor Center look similiar to the buildings in the card,Tijeras is a Pueblo or village. Other clue is that holepunch & Galactic Center are positioned just like Chaco Canyon/Anasazi roots. The clues in Reward Cipher have: A-shape and Tijeras Ruins is in this shape with one side slightly longer than the other (See YouTube Video). U w/ a vertical line map symbol for mine and Tijeras has a "Peak Thru The Pines" Malachite mine viewing point. The Square shapes and Tijeras rooms are all square, not round. S-shape for Canyon/river/stream and Tijeras is in a Canyon, river not far & stream or wash goes thru it. The kiva partially colored in square for solstice/equinox events. Colored in triangle for map monument symbol and this archaeological site is a monument..4 rock map symbols as in a trail, Tijeras has trails & spots lined with rocks. The end of the trail has a grinding rock/boulder just like map symbol for rock at the end of the reward cipher. This cipher is the end of Jack Tarrance Zodiac Killer trail. The 3-Pt starts off with areas close to Northern California as-in Miwok symbols & more with the 340 & My Name Is, 6/26/70 & other clues going to parts of AZ/NV/CO/NM....it ends with this cipher. 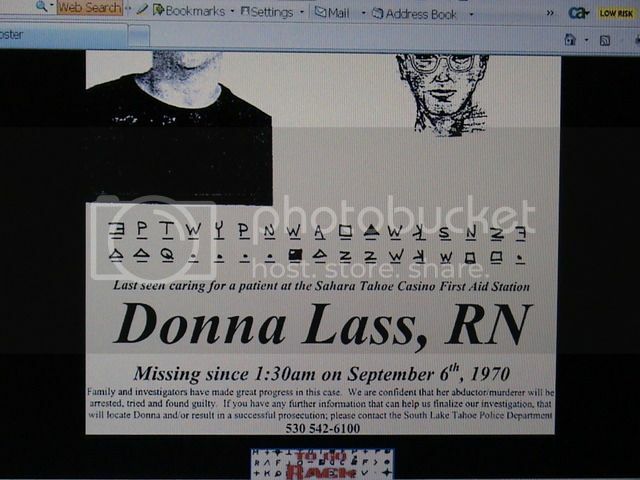 Does it mean we can find Donna Lass at Tijeras which has same basic rootword meaning as Tahoe? I hope so but at least there is the name of the spot that's in Donna Lass Cipher. Adding more details on it later. 8/3/11 I did add more details...been online for weeks, now. One of them is that there is Cherokee Syllabary A-Shape here that matches the Tijera's Pueblo Ruin's shape. IT's not seen in the other ciphers, like several other symbols. Cherokee Syllabary so-far found from Lipstick Killer to Black Dahlia to Zodiac Killer to John Walsh Scorpion Ciphers to Tom Voigt Letters to 2005 Tim Miller Texas I-45 Killer letters. YES, THEY ALL LINK TOGETHER. Thank God I WAS RAISED IN PART BY A CHEROKEE who is a cousin in our family tree, had friends & families who were Indian and all the oral stories they shared as I wouldn't have been able to follow the Indian Trail of JACKS. FYI, just by marrying an Indian when he did, that was a very, radical move. DENNIS: MY CHEROKEE FAMILY MEMBER moved every 6 mos or so like you as a kid because it has always been rough for anyone with legal or obvious Indian heritage and people in USA don't accept the facts that they were here first and hate them, discriminate and more. Talk to an Indian and they will tell you what it's like to live in USA even at today's standards: THEY ARE NOT HAPPY WITH IMPOVERISHED RESERVATIONS, MONEY MISSING, and there are wars going on in courts for decades like they were when Indian's occupied Alcatraz, Seattle Fort, Mayflower 2. It doesn't make sense that there would be a encryption on a reward poster. Yes, it would be great to know more about that poster. I have read various things about it over the years, but if an actual family member could tell you about the origins of the poster, that would help clear things up. Is anyone attempted to contact the Lass family? Is there anyone still around to contact? There is a man who knows a lot about the Lass case and has been in touch with Donna's sister for what sounds like 10 years or more. His name is Howard Davis. he runs a site called the Zodiac Manson connection. He has some strange idea that Bruce Davis of the Manson Family is the Zodiac, but his site is a good place to read up on Donna's case. He makes his information available to all and seems willing to help people regardless of whether or not they think his suspect is the Zodiac. It might be worth a try for Nanette to contact him.